Backup server monitoring is a vital part of any reliable intranet. Making backups is an important periodic task; if neglected; it can cost quite a number of time and other resources in case an important data is lost for any reason (starting with hardware failure). At any given moment it is convenient to know the actual state of a backup server: whether all the required services are running it is and what is going on there, in general and in details. To learn what is going on, it is not sufficient to perform simple tests such as pinging the backup server and/or making sure it accepts connections on certain ports. There are two tasks to solve: test administrative interface, if present, and make sure required processes are indeed running. Let’s assume we are using BackupPC backup solution. To test an administrative interface, we should open a known URL and authenticate there; if page looks correct (contains an expected text, for example), we may be sure the interface works. This can be easily monitored manually. Testing processes presence is somewhat more tricky: for optimal backup server performance, backup tasks should be scheduled so that they won’t overlap too much: in case of large-volume backups and/or slow connectivity with backup server simultaneous backups may degrade the overall efficiency of the server and make the whole operation run slower than the same backups running subsequently. To find possible bottlenecks, this kind of monitoring should be performed regularly, to find how the backup tasks are actually performed. It’s quite tricky to monitor these manually. 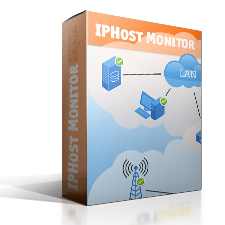 We can significantly reduce time required to perform both monitoring tasks by using IPHost Network Monitor’s Web Transaction Monitor and SNMP monitors. The former can be used to simulate log on sequence on a backup server’s Web interface and find string “BackupPC Server Status”. To do the second task, we can make use of SNMP daemon feature allowing to run an arbitrary program or script and return its exit code as a numeric value of the monitor. It’s easy to run a script running command like this one: ps axu | grep perl | grep BackupPC_dump | grep taskname | wc -l (it will return the number of line containing task name, from among the list of active backup processes) and use SNMP’s daemon ‘exec’ command to assign a required ID to the returned result. If the number of lines if above zero, the backup task in question is running; if zero – stopped running. Also, the new monitor types can be used to count running backup processes – either SNMP process or SSH process monitor: just set ‘Process name’ parameter to the backup process name and leave ‘Metric’ parameter as default ‘Processes total’. The monitor will show the number of running processes with the specified name. 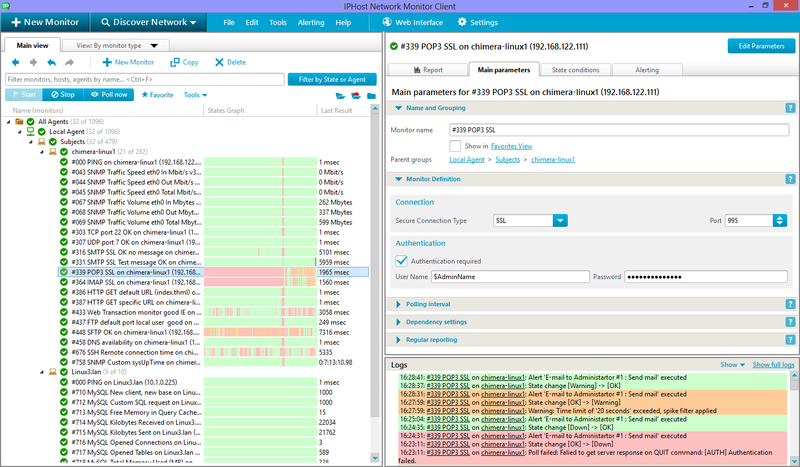 Monitoring tasks becomes simple: assign as many SNMP monitors as many tasks are created at the backup server. This will allow to view charts where all the active tasks will be shown. 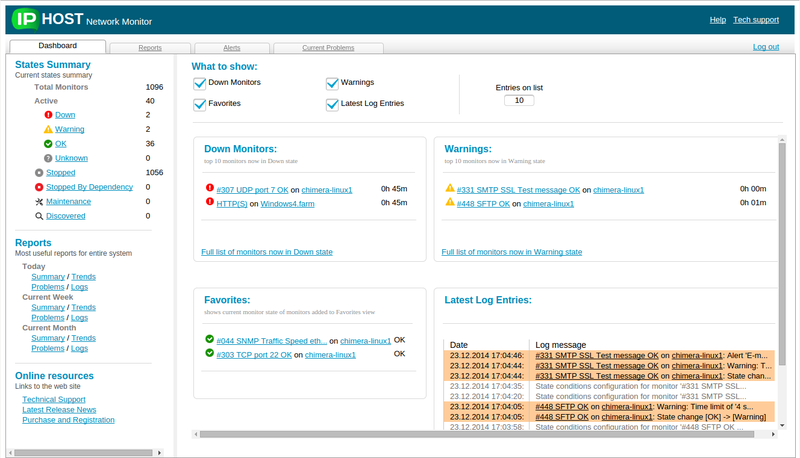 Please note that the SNMP disk space monitor can be used to monitor free space available for backups and the above SNMP trick can be used for other meaningful parameters we could like to monitor. Make sure you allow a reasonable time to connect to SNMP: in case the backup server is busy and/or available through a slow connection, SNMP connection attempt may expire too early giving unexpected results.